Satellite technology is used to provide the first mile connection or gateway from the network to the Internet. Satellite is ideal for users that are located in remote areas where wire line or RF/microwave solutions are either unavailable due to distances or unreasonable due to cost. Dispersed and remote communities requiring broadband access can share a single satellite terminal and have services distributed to WiFi access points. 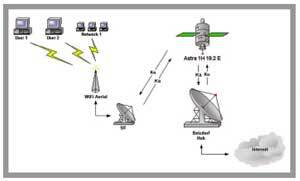 The IP gateway of the satellite terminal is connected to the community's wireless distribution system. The benefits of Satellite are fast deployment times and independence from terestial communications infrastructure.